As we discussed in the last article posted on the blog, having cats and dogs living together can be pretty complicated. They are two very different species with a two sets of completely different standards. Cats and dogs need some time to get adjusted to one another. However, with a bit of patience, hard work, and the ever present consistency required for pet training you can have a multiple pet household that gets along famously. 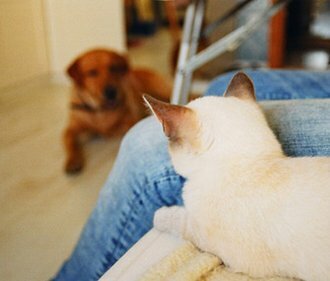 To begin getting your cats and dogs living together, it’s important to focus on training the dog rather than the cat. An adult feline will almost always reject a forced friendship. Dogs are like tornadoes of instability to a cat. To a dog, a cat is either a new friend or a very different breed of squirrel that is still meant to be chased. That’s why it is imperative to have a fairly well behaved dog if there is any hope of this process progressing beyond step one. Your dog should be able to successfully and consistently perform the “sit,” “stay,” and “leave it” commands. Once your dog is capable of behaving itself, begin introductions via smell. Keep the cat in a separate room with some toys, food/water, and a litter box. This will help the animals to start recognizing each other’s scent. You can also crate the two of them and place the crates near one another. This is so the cats and dogs can see and smell one another without threatening the cat’s security. These introductions should be treated with caution keeping the dog under close watch, for at least a week before going any further. After this initial smelling out phase, you should begin bringing the dog into the same room with the cat on a leash, or perhaps allowing the cat to roam freely around the house with the dog on a leash. Be forewarned, this step can take weeks, even months, and some dogs will have such a drive to hunt that you’ll never be able to reconcile the presence of a cat. In such a case, you’ll have to admit you made a mistake and rehome one or the other. Be sure to keep them away from each other’s food dishes, or any other spots/toys that they might feel especially protective of. Every time the dog sees the cat, pay the dog lots of attention and praise. This is to make the dog understand that having a cat around is a good thing. As soon as your dog can become acclimated to the idea of leaving the cat alone with your supervision, you can let it off the leash. You may want to consider buying a remote control collar for even further assurance of a dog’s good behavior. Once all this is accomplished, you’ll have pretty much succeeded getting your cats and dogs living together. However, there is still a lot more involved in the process. Check back in next time for the final installment of this three part guide on socializing cats and dogs.